This year, I am setting different goals for myself. I will hit them, no doubt! Last year, I hit LOTS of my goals. This year, keeping it short and sweet. - Blog more, and help others get in to fitness by inspiring them with little weekly motivations. - Do a walking handstand for 10 steps. What are your fit goals? Ok, we all know it isn't realistic to skip out on all the delicious food & drinks the holiday has to offer. I mean it is possible, but it might drive you a little crazy. Go in to your day with a plan. 1. Workout the day of the holiday, so I am feeling ok before going in to the party. 2. Eat what I want or drink what I want, NOT BOTH. If I want numerous cocktails, I will try to not have numerous cookies. (it's hard, but worth it). 3. Walk around after your meal. Get a group together, and go out for 15-30 minutes. Hope these tricks work for you. They are simple, and do-able! Loving being in the holiday spirit, so today I treated myself to a Mani/pedi! 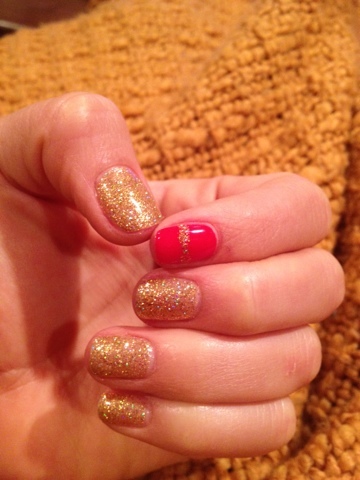 I got the gel manicure with gold, one nail red with a gold stripe! My toes I got all gold, with one toe red and a gold stripe. Go treat yourself, maybe even a family member to some nail glam! Get creative! I am passing around gifts this week. Nothing says Happy Holidays like a homemade gift. For those of us whose wallets aren't full this season, it's time to get creative. 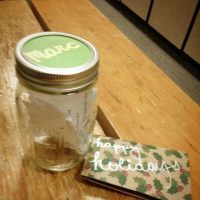 I made a jar of workouts (around 20). The workouts range from body weight, to fun cardio ideas, circuit training, TRX, deck of cards workout, and park workout. If you need some workout ideas, go to my workouts of the day. What are you waiting for? Does January 1st mean you are going to wait to start your resolution and for now just slack off? In 14 days, you can make big changes! You can seriously start getting super fit, before 2013! December 18: Drink 8 cups of water minimum. You can add fruit to your water to make it easier to drink! December 19: Increase your normal workout to push your limits. This can be increasing your weight on a lift, increasing the distance you run, adding on 5 minutes to your cardio, doing more advanced moves in yoga, etc. December 20: Eat more green veggies. Make today the day where salad, asparagus, broccoli, cucumber, edamame, avocado, zucchini, parsley, lime, cilantro, bell peppers, and everything else green us your friend! Greens are rich in fiber, vitamins, and also are very hydrating! Spend some time at the market picking out seasonal organic veggies to cook a scrumptious meal! Skies the limit with this one! This holiday season be sure to take care of yourself. We need recovery, and that happens when we sleep! If you normally sleep 5-7 hours shoot for 8 or 9! If you sleep 8 or 9, take a mid day nap to recharge! December 23: Try something new with friends or family. Enjoy your time writing cards and wrapping gifts for your loved ones. Remember why you are thankful for them, and how they have impacted your life. Giving feels great! Today, it's inevitable there will be junk food surrounding you! Try to go on a walk in the morning, after breakfast, after lunch, and dinner! It's easy to do and will help you remember to get your blood flowing and your body moving! This morning take the time to jot down all the things you love about yourself. Before we go in to the new year lets reflect on all the positives of 2012. As a friend, co-worker, or family member to push you today. Both of you can "train" each other and help one another push your workout to the next level. Try to cut out all added salt and sugar in your diet for a bit and see how you feel. You may feel less bloated, more clean, and healthy! When goal setting make a few pages. Make professional, personal, and social goals for yourself! Start the year off right with a washed car, clean clothes, a HEALTHY stocked fridge, a clean room, and organized desk! There's no better way to start the year with a clear mind and clean space! I created a little workout for myself post-birthday. 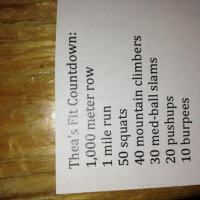 I named it Good Luck Chuck, because this workout should be a killer! I am going to a CrossFit potluck tonight, and that means people are definitely aware of what's being served. Picky eaters who like to eat healthy will be looking at each recipe to make sure it's something they will eat. I hope this recipe can wow a few! 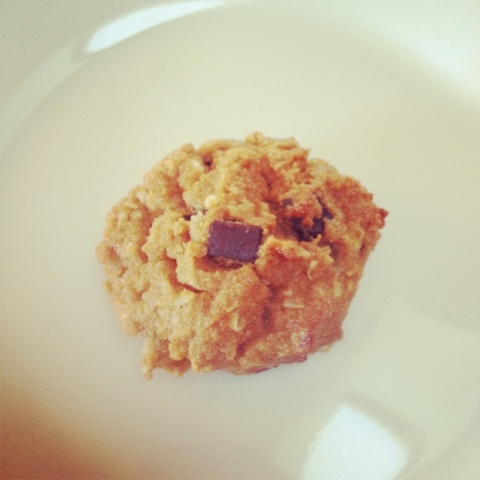 It's gluten-free, free of white sugar, flourless, and DELISH! 2. In a bowl, mix the coconut oil, vanilla extract, eggs and almond milk together. 3. In a seperate bowl, stir the coconut sugar, coconut flour, baking soda, and salt together. 4. Pour the wet ingredients into the dry and stir until combined. 6. Grab a spoonful and roll into a ball with your hands then place on oiled cookie sheet. 7. Bake for about 20 minutes until lightly brown.